From This Side of the Pond: Anyone for a little bit of random? Linda at Second Cup of Coffee is hosting a meme today and its theme is 'random'. 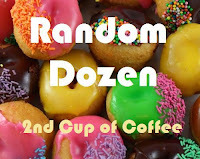 If you read my blog you know I can do random and in fact I like to think I excel at random so I thought I'd give it a go....if you'd like to participate just answer the questions in a comment below or on your own blog. twitter....really I am just not getting it people...'nuff said. Oh see I can be succinct. Maybe I should be on twitter. this is too hard and I've strained my brain trying to limit my answer to one...How Great Thou Art. There. I picked just one. Nathaniel . Obviously that would have been the boy name. And obviously I'm a girl. I love to write. I have alot of opinions. I talk too much. Actually that last one I may have already known. Well, going walking now so will wear my walking clothes. Then, hmm...probably jeans and a top (its cool outside) and I don't know that this says anything about me or how I'm feeling other than that I do love a great pair of jeans. And a great pair of shoes but that would be a whole 'nother post. Joyce! Great answers! Twitter seems to be the dominant head scratching item of the moment. I feel the same way. #6 I wholeheartedly agree on. And lastly, your walking clothes say that you are taking care of yourself and prefer to do so outdoors rather than on a treadmill? And Twitter? Sigh...yeah, I got sucked into that. It's like blogging on speed and hurts my head, but I can take it in small doses. Your answer to #8 should have been MY answer! Oh my goodness I needed your advice! Why don't you just move to Dallas so you can help me with all my children's - their lisps and their vocabularies! I love this post! I learned so much about you just from reading your answers! I too, am not about to sign up for Twitter, Facebook or MySpace. For now it's just the blogging community and that suits me just fine! Chocolate, oh yeah, bring that one. Always need to make sure it exists in some form in our home. Joyce, I love your answers and like you ...I don't need anything else to steal my time so why "twitter "Or facebook for that matter. It was fun reading you! Mmmmm, people can send me chocolate in the mail anytime! I don't get Twittering either. I'm so uncool. LOL. I haven't even tried to Twitter yet. It is all I can do to keep up with email, blog and do Facebook. I LOVE chocolate too. Any kind!!! I like to talk too, in case you haven't figured that out by now. Hope Tim had a great birthday! Love & blessings from NC! I like this meme, Joyce. I might try it today if I get the chance. I like a nice comfy pair of jeans, too. I tried Twitter for like 2 minutes and I just don't get what all the craze is about either. It's just not workin' for me. I'm glad I get to blog, let alone Twitter. Now I realize twittering is quicker, but blogging is absolutely, without a doubt, more fun. This was fun! I did mine on my own blog. Come see! I saw on our friend Lisa's blog that your daughter had filmed a commercial for Furman. I will have to watch and see if it is on our television here in NC, as you said it would be shown in the Carolinas. I hope you will get to see some of the games!! Have a wonderful holiday weekend. Love & blessings from NC! Hi, not sure how I found your blog but I enjoy reading. First time commenting because I was surprised that I had so many of the same answers to this quiz: #1 (I only go for dog food), 2,3,6,7 (I was suppose to be a boy- Danny Ray, 8 (yeah, what the heck is my purpose in life now? ), and 9. For some strange reason I like taking quizzes!